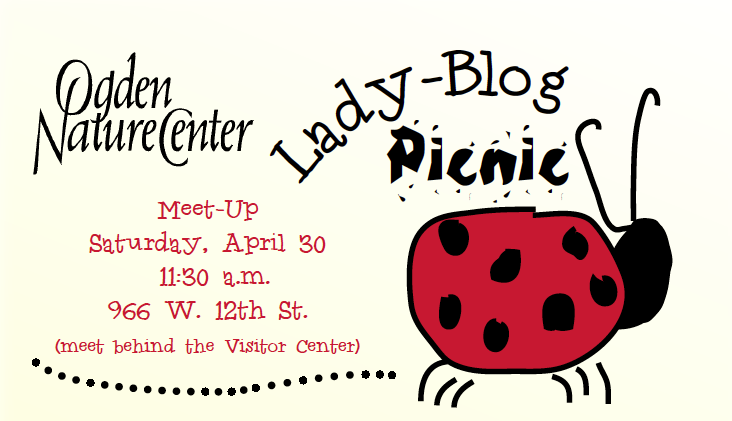 Paige Hill: Please Come to the Lady Blog Picnic! We want Utah's blogging ladies to get to know the OGDEN NATURE CENTER! … So pack up your kiddos, wear your sneakers and join us for a free picnic lunch, nature games, activities and fun in our BACKYARD! Rain or shine. (If it rains, we'll be inside with the snakes and tortoises.) Please RSVP by Tuesday, April 26th to visitor@Ogdennaturecenter.org or call 801-621-7595. Let us know your name, your email address, how many kids you are bringing and their ages so we can plan for yummy food, pb&J's and goofy games! Check us out at www.ogdennaturecenter.org. Follow us on Twitter! Like us on Facebook! I am so excited about this! We are a "Nature Center" family, so I hope all of my Utah Blogging friends come out and see what the ONC has to offer. Let me know if you can come! Oh, how wonderful--what a perfect name for your adventure! Wish I could join you--if it was in June during our visit to Grandma's, I'd be there! California's just a bit to far.....! Hope you all have the loveliest time together! have a slice of watermelon for me. I only wish I was still a stay at home mom with little kids to bring to the picnic. Sounds like a great time! I hope you have a wonderful turnout! I can't wait to hear all about it though!